Colored contact lenses allow you to temporarily change your eye color whether or not you need to correct impaired vision. In this way, you can create a more subtle eye appearance, wear a crazy design for special occasions, or just enjoy a new eye color. Will Colored Contacts Change the Way I See? Yes, but only if your colored contacts also contain a prescription to correct nearsightedness, farsightedness or astigmatism. Whether you have prescriptive lenses or cosmetic colored lenses, the center of the lens remains colorless to avoid affecting how you see. Only the part that covers your iris, or the colored part of your eye, contains color; that's what changes your visible eye color. Will Colored Contacts Look Natural? Yes, most colored contact lenses use lines, dots and other shapes to mimic the pattern of your iris. What Kinds of Tints Are Available? Your contact lens may have a light green or blue tint to help you see it better. This makes it easier to insert and remove your lens. It's easier to find, too, if you drop it. Visibility tints are so faint that they won't affect your vision or eye color. 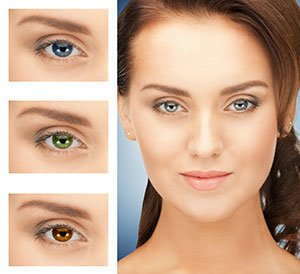 This type of contact lens is slightly darker than a visibility tint and is designed to enhance your natural eye color. This type of tint works well for people who want a more intense eye color. This contact lens can give you a completely new eye color. People with dark eyes usually need an opaque tint to alter the color of their eyes. The most commonly selected colors are green, blue, hazel, violet, amethyst, gray and brown. Theatrical contact lenses can create special effects for movies and costumes to make you look like a vampire or alien. However, theatrical contact lenses are still a medical device—they should never be shared with anyone. If you're thinking about color contact lenses, your eye care provider can help you select the right type of colored contacts depending on your eye color, quality of vision and desired appearance.